SARANGANI PROVINCE – Just about a week before his 37th birthday, world eight-division boxing champion and Sarangani Rep. Manny Pacquiao gave away 150 housing units to homeless residents of Bales village, Maasim town in this province. Pacquiao, however, told recipients to thank God, not him as he is just being used by the Almighty One to help people in need. The project, dubbed Pacman Village, with a total cost of P28.5 million was funded out of Pacquiao’s personal funds. Ricardo A. Marcellana, project contractor, told Philboxing.com that a total of 300 housing units will be built in the four-hectare land purchased by Pacquiao a few years back. “The P28.5 million was just a total project cost. It does not include the cost of buying the land used for the project,” Marcellana revealed. Marcella further disclosed that construction of the second phase, which is comprised of additional 150 housing units, will start this week and is expected to be completed by February next year. Joseph Abatayo, one of the beneficiaries, thanked Pacquiao for his concern and generosity towards poor residents in the area. “He (Pacquiao) is the only politician I knew who has a big heart for poor people like us. Imagine, he’s spending his own hard-earned money for high-impact project like this,” Abatayo said. 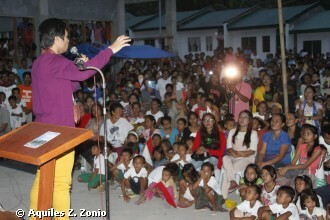 In his speech, Pacquiao urged the beneficiaries to value the property given to them. “Give thanks to God for what you have received today. It’s a gift from Him. He’s just using me to help you. Take good care of this property and don’t sell it,” Pacquiao told the project recipients. Pacquiao disclosed that more homeless residents may receive similar blessings as his target is to build a total of 600 housing units in the area. “There are still lots of spaces here where we can build more houses. I’m targeting a total of 600 housing units to accommodate more homeless residents here,” Pacquiao said. The Filipino boxing legend asked residents in the area to be meticulous in electing local and national candidates in the coming 2016 elections. “Vote for candidates who are competent and with a good heart. The future of this country depends on the kind of leaders we choose,” Pacquiao said. The boxer-politician told the crowd he has never compromised his principle while serving as congressman of Sarangani. “You should be proud of me as your congressman. I don’t steal government money, in fact, I’m spending my own resources to help you. I neither sell my principle nor my vote in Congress,” he said. Tino Alcala, chair of an impoverished and rustic Bales village, hailed Pacquiao for doing his job as their representative in Congress. “This is the kind of leader we’re looking for. Unlike other congressmen, who disappeared and could no longer be seen after election, Cong. Pacquiao is always there everytime we need him,” Alcala said. TOP PHOTO: Pinoy boxing legend and Sarangani Cong. Manny Pacquiao urged beneficiaries of his housing project in Bales, Maasim, Sarangani Province, not to sell the property given to them. He told them to thank God not him as God is just using him to help people in need. Pacquiao turned over 150 housing units to recipients over the weekend. According to him, this is just the first phase of his project. The construction of the second phase is expected to commence soon. He is targeting a total 600 beneficiaries in Maasim alone. ROWS of newly-built houses were turned over by Filipino boxing icon and Sarangani Cong. Manny Pacquiao to 150 homeless families in Barangay Bales, Maasim, Sarangani Province. The project, dubbed Pacman Village, had a total cost of P28.5 million funded with Pacquiao's personal money. Photo by Aquiles Z. Zonio. Click here to view a list of other articles written by Aquiles Z. Zonio.